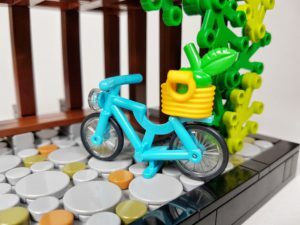 Alright, let’s take a look at this small Lego pergola MOC, which if you ask me is quite a quaint little build. I really enjoy putting builds like this together because it doesn’t take much thought. It ends up being a very relaxing exercise. Sometimes when building larger scale MOCs like modulars, there’s a fair amount of math and planning that has to be done and it can get tedious and at times frustrating. It’s sometimes best to just tinker with a smaller design like this one! Designing a small wooden frame for the pergola was a breeze and didn’t take much time at all. But it’s the final, finishing touches that you add to a build that really bring it to life. 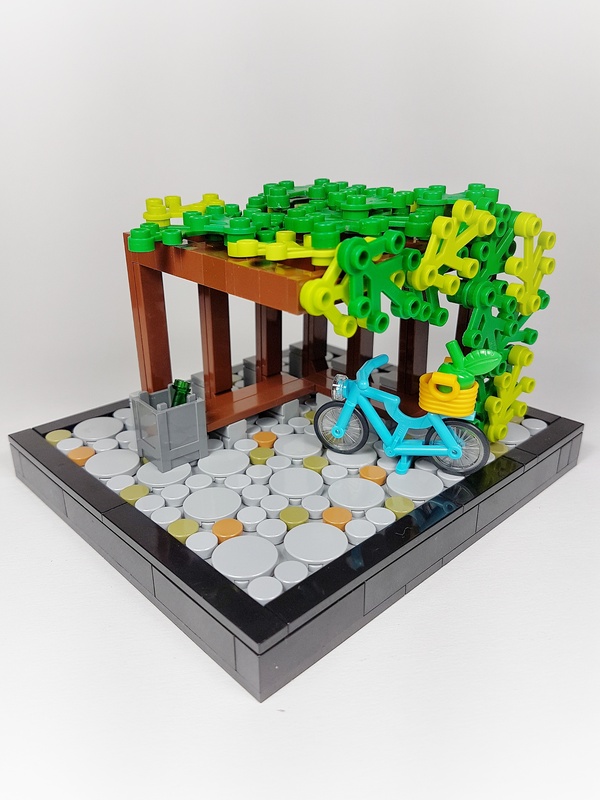 I added some vines to the top and side of the pergola, then placed a bright blue bike with picnic basket on the back resting underneath. It’s a small MOC, so I didn’t to overdo it with too much to look at. Sometimes less is more, and when it comes to the simplistic nature of Lego bricks, I often find this to be true.